Aha Ge_rik does a Vid of that, but it is easy enough. On my instruction sheet Page 7 refers to the Chuff Rate on Button 7 in the text there. Set Loco on a set of Rollers and you should be able to follow those notes. I refrained from exact description as the remotes can differ in the way they work to set up those Chuff rates. But it can be done to get 4/6 or even 8 chuffs per revolution of the wheels. You use the throttle to increase the 'chuff' on the MLS.. But let's face it, on a rod-driven loco, it just needs to chufflikemad! The Aristocraft 27 mhz are known to have leaky mosfets. I have a voltmeter (VOM style) on my track and with no engines or cars on the track the meter goes over 10 volts from this leakage. If you have a digital meter your readings will read higher as digital meters have a lower load than coil meters. Been this way for more than 15 years!! Not sure what you are saying Dan I am just a poor simpleton in these matters, even after 15 years with a garden railway. I am asking as I have not ever had readings like this, voltage seemingly stuck at a midpoint and no action from the motors or lights (just a little spark from betwixt loco wheels and rollers at one point) - in over 15 years of ownership of the same Aristo TE combo' and digital meter. As mentioned both tested locos were on the rollers/track at the time. Edit - Having had a quick look at the "tutorial", are those "mosfets" the things sitting in that dirty great heat sink near the top of my picture of the 5473's innards in an earlier post. What do they say - "A little knowledge is a dangerous thing" ? I shall leave well alone but could they be replaced if needs be ? Anything can be replaced / repaired.. Whether you can find someone to take the job on, ans whether it would be cost effective, ia a moot point. i would guess, either the electronics got confused (doubtful, if multiple power-cycles were involved) or more likely, either dirty/poor connection somewhere, or a loose wire causing a short, and the unit to shutdown. I would clean track the rollers sit on. area of rollers that picks-up from track. rollers. Wheels / tyres / wheel-backs / check wipers and/or brushes..
Then would give the loco a good shaking, abd try again. - Do this a couple of times, we are looking for an intermittent fault. If still all good, put it down to another unexplained mystery, of 'elektrickery'.. I shall leave well alone but could they be replaced if needs be ? That link is to part of a highly respected website. Based on it I recommend you leave the train engineer alone with the exception of adding a resistor to the output as suggested. Personally I'd go OTT and fit a 100 Ohm 10 Watt resistor. All you'd need to do is bend and cut the resistor leads to suit and fix it to the output terminals with the same screws used for the output wires to the track. Thank you for the link Neil. I forgot about checking Mr Schreyer's handy tips site - well thumbed over the years by myself, in a virtual sense. The only problem is I cannot understand a word of what it is saying there. It's all in Electroneze, even the schematics are mostly like strange hieroglyphics to me. Although bits of it do seem to ring a bell as to what I was witnessing. As for what you suggest I cannot even start to visualize that. I am that ignorant in these matters Putting a resistor across both terminals sounds like one is creating a short (See, I really do not understand how these things work). Many shortcomings are not addressed especially when they cost money... welcome to Aristo. OK, although it appears all is well now with my Aristo' TE tx/rx combo' I reckon it might be prudent to follow the advice from the good Mr Schreyer and others here and buy and install a 100 ohm/10 watt resistor across the track output terminals of the 5471 rx. Before I plug it in and pump some juice through it could someone take a look at the picture and confirm I have not misundersrood something and about to consign this unit to some terrible terminal event. The resistor (as if I needed to tell any of the knowledgable souls here) is the gold bit (says HS10 100 R J on the case) screwed to the side of the 5471. I chose that one as it could be screw fixed to the 5471's plaxtic body rather than flapping around loose. Silly question, amongst thhe many I have posted of late - Will I notice any difference in its operation as a result ? As regards the wiring: That looks fine. As regards 'any difference': The unit should not 'hang', as it did for you. As regards where it is mounted: What is the case made from? - It is a chunky resistor, and will get warm. Especially outside in full-sun. Check how hot it is, frequently but carefully (burnt fingers, if hot) during your first-run with it fitted. - Better safe than sorry. The case appears to be anodized aluminium. The 5471 rx is kept out of the sun as is the transformer. Could put a bit of insulation between it and the plastic body (though the brass screws might conduct some heat) a bit of 2 mm cork perhaps ? It's pretty easy to calculate the maximum power dissipation of the resistor, take your max output voltage, divide by the resistance and you have your current. So you 10 watt resistor should run at 5 watts max... and it will be warm then... but not burn you. so V=IR or I=V/R or 12/100 or 0.12 amps, so W=VI or watts = 12 * 0.12 or 1.44 watts... so you are well within the safety limits and should have no heat issues. Thank you Greg, I think I understand that. 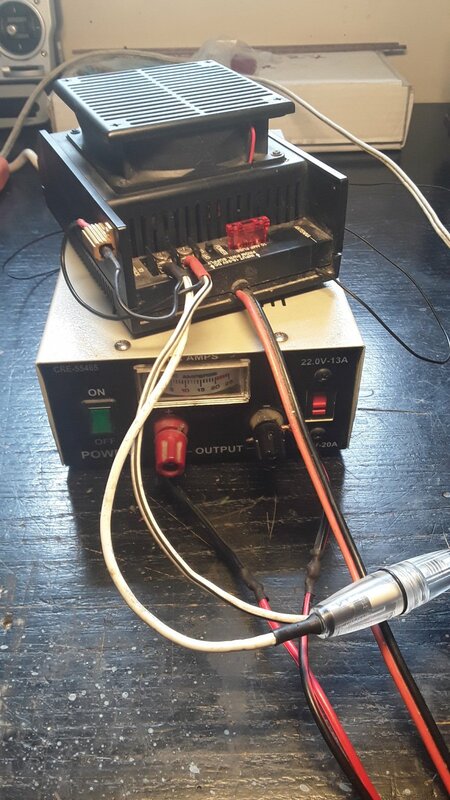 So 13.8v is 13.8/100 amps, or .138 amps times 13.8v = 1.9 watts... still ok..
At 22v, you are coming close to exceeding the operating voltage for your TE, and also would be 4.84 watts, still ok on the wattage, but it will be hot, and could soften plastic at prolonged high voltages. I know the system is speced to run to 24v dc... and I know it is a 10 watt resistor. If you run at 22v I would suggest mounting the resistor to a larger flat plate of metal, and making physical contact not possible.